Where to stay: The Shady Dell Vintage Trailer Court – 1 Douglas Road, Bisbee, Arizona, (520) 432-3567, theshadydell.com. What to do: Bisbee Mining and Historical Museum – 5 Copper Queen Plaza, Bisbee, Arizona, (520) 432-7071, bisbeemuseum.org. “You’ll know yours by the shine,” said Shady Dell Vintage Trailer Courtmanager Brad Hardy. He was escorting me to my home for the night, a 1955 Airstream. Even though it was built during the Eisenhower era, its polished aluminum exterior gleamed like it had rolled off the factory floor yesterday. The Airstream was the only model of its kind in a fleet of 10 travel trailers, all dating from 1947 to 1959 and nested under trees and beside tiki statues at the Bisbee, Arizona, resort. Yet even the less iconic trailers were so meticulously renovated, I half expected Frank Sinatra to pull up in a Cadillac and ask me to join him for an egg cream in the Shady Dell’s 1950s-style diner. The first resort I visited is in coastal Seaview, Washington. The Sou’wester Historic Lodge and Vintage Travel Trailer Resort boasts 25 trailers, from a compact Shasta that sleeps one to the African Queen, a tri-level colossus that sleeps eight. 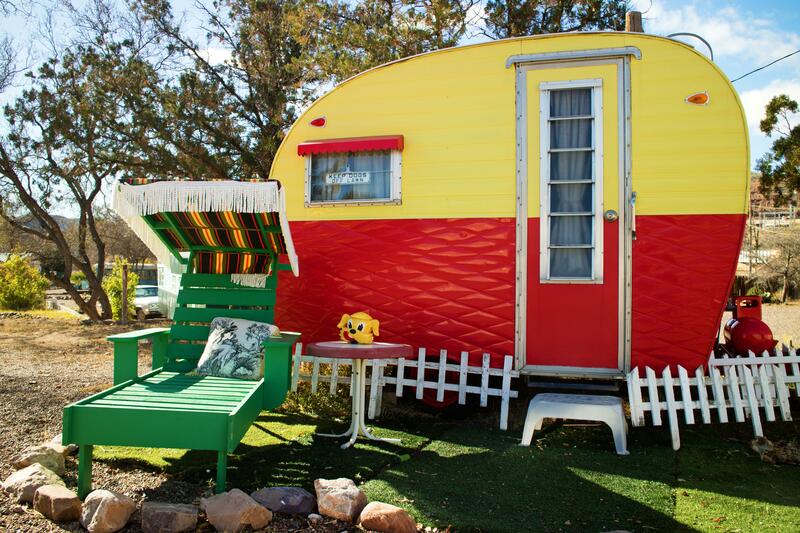 The resort also offers cabins, lodge suites, campsites and bring-your-own RV hookups across its 3-acre grounds. The Sou’wester makes it spectacularly difficult to decide what to do. A tiny blue trailer named the Q-Tea holds an organic teahouse. Wellness activities include meditation, yoga and lectures. Massage and quarterly art exhibitions are available in two trailers. Guests can take art classes, including writing workshops, waltz and embroidery. The Sou’wester has even hosted more than 500 artists-in-residence through a nonprofit organization that administers its arts, music and wellness programs. We surveyed the shelves inside the Sou’wester’s honor-system thrift store, which was housed in a creamy white 1960s Kenskill trailer with panoramic windows, before hitting the clothing-optional Finnish sauna. We opted for swimsuits – a wise choice, as similarly clad guests sat shoulder to shoulder inside the steamy cedar building. Afterward, we headed back to the lodge where the Sou’wester hosts live music most Saturday nights. The four of us squeezed into the room where Lenore, a band based in Portland, Oregon, was playing. We stayed for a few songs before snuggling into our respective pods, dry and warm during a nighttime squall. The next morning, Andrew and I picked our way through the puddles to Margo and Tom’s RV. Margo opened the door, and a furry ball of barking Chihuahuas tumbled onto the grass. It was time to burn some energy. Published: March 17, 2019, 4:30 a.m.